Are You Ready To Step Up Your Turning Technique? Because it makes turning easy, this board allows you to concentrate on the technique. You will notice improvements in body, arm and leg posture as well as quick and confident spotting. Advance faster towards your dancing or ballet goal! This training equipment is made out of a durable and resistant material that will not damage your floor. It has an extra EVA foam padding to prevent any accidents. It is also longer and wider than most other products on the market so that you benefit from the comfort you expect and deserve. Apart from the premium box, you will also receive some bonuses to encourage you to start practicing as soon as it arrives. You will get a velvet drawstring bag to protect your board from dust and scratches, a simple cotton bag for shoes, a purple dance ribbon as well as access to a special eBook. And if you don’t absolutely love your Primevo Turning Board, just come to us for a no questions asked Full Refund! 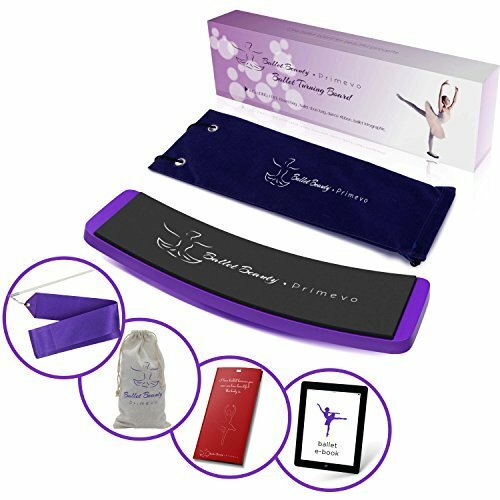 Click add to cart and start improving your balance, pirouettes and turns! If you have any questions about this product by Primevo, contact us by completing and submitting the form below. If you are looking for a specif part number, please include it with your message.